So fast, it is almost a month time since I start to work. Weee…few more days is pay day! So far so good, I manage to pull through it on my job and at the same time manage the house well. My role of job started immediately after the training ends. Every day my job got to be picking up calls, many many calls. The interval time for calls coming is between 5-8 mins after one another. The line was main hunting line and 4 of us in charge to entertain it. If the call was related to support then I got to jot down their problem/ complain and log ticket. Sometime also got scold by customer and rush us for solution delivery. Being in this post I got to be a very good listener to find out their problem encounter and try to get their problems in detail as precisely as possible. Early weeks when start picking up calls getting ppl scold, blame and shout, actually I was kind of depress and stressful. But after my supervisor advice and colleagues support on how to handle those situation and response those calls, I’m getting better now for learn not to take their words in heart and not to bring those emotions and problems back home. During the working hour, I got to be multi-tasking to handle calls, MSN and Skype, log complain, do remote access and also at the same time to find solution for them. This kind of task, never get us to feel sleepy coz it is fully occupy. Although we facilitate with full usage of Internet, believe me I don’t even have a wee bit of 10 mins of time to go on FB or others, not to say a quick blogging. After working hour, for the good of 30 minutes I can sit down for dinner, the rest of the hours before bedtime I’m will be occupy on the house chores and accompany Terry. No TV, newspapers time at all. By the time I got the ME time it was about 10pm or 10.30pm and I really totally flat out by then. For the weekend, more or less still occupy with house chores, church, accompany family, shopping and other programs, I still trying hard to find the free time to go online. See now… I have been deeply missing so much of my blogging time, I got lots want to share, but too little time now, not to say blog hop. Very soon I will not be able to update what happen around with my friends in Facebook and also to my dear blog friends. So, pls don’t leave me if I’m not hop. I will try to my best to keep up in blog and soon if I can manage my time well then only I’ll do more. As for Terry, he is quite adapt to the daycare life now. The only thing is he do not have enough of sleep time. 2 hours of nap time at school is too short for him and at night I try to speed up my work so that I can accompany him to sleep early at 9.30pm or 10pm (wake up at 7.45am). Daddy has been start involve in helping to fetch him back from school after work and try to back early to help put him to sleep. Since the day he starts daycare I have been very worried and concern on his health. Been forcing him to drink lots of water (1 litre at least) and popping 400mg Vitamin C everyday. As I know the chance to get sick is rather higher for daycare kids. Just recently cases of HMFD and H1N1 is hitting. His kindy got a suspected case of H1N1 recently and the school will be close 1 day (weekend) for disinfection. I'm still looking for any other nutrition food to boost his immune, any recommendation? The Parent's Day is coming soon I have been taking a day off work to go for that 15 mins short section of discusion on progress and development. OK, thats all for now, if not a holiday today I don't think I'm able to update blog. Think that I got 3 days off in a row, No, I don't have. Judy, Glad to hear you and Terry are coping well. Gwen doesn't drink much water. I'm having prob forcing her to drink water. Lots Vit C can help boost his immune system. Gwen's taking Abbott's gummy minibear multivits. I think your new routine is considered good, since you can go to bed by 10pm+. Wow, 2-hour nap is not enough for Terry? He can really sleep hor? hang in there. you will adapt to it in no time. family and of cos terry comes first, they are ur top most priorities! 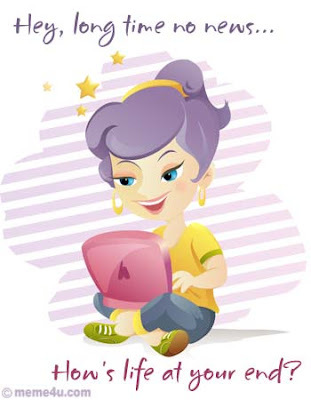 don worry, blog when u are free, ur blogging friends are always here and waiting to hear from u! wow.. you are very busy leh... great to read about your updates..
Good to hear from you. Glad that Terry adapting the daycare so well. Blend some vege fruit juice for him, can help boost his immune system. Wow, Terry can sleep quite a lot yah. Bryan only naps for max 1 hr and then at night, sleeps from 1030pm to 730am. More than enough for him! !